Christmas day was spent with the publican’s family – who took pity on the ‘orphans’ in town and we were treated to a feast of seafood, salads, roasts and desserts. It was a lovely way to celebrate Christmas in the bush and a reminder of the dichotomy that sees country people fiercely private but genuinely welcoming at the same time. New Year’s Eve, on the other hand, was spectacularly unremarkable and, thanks to the interminable heat and consequent lack of energy we only just managed to stay awake long enough to see in the New Year. 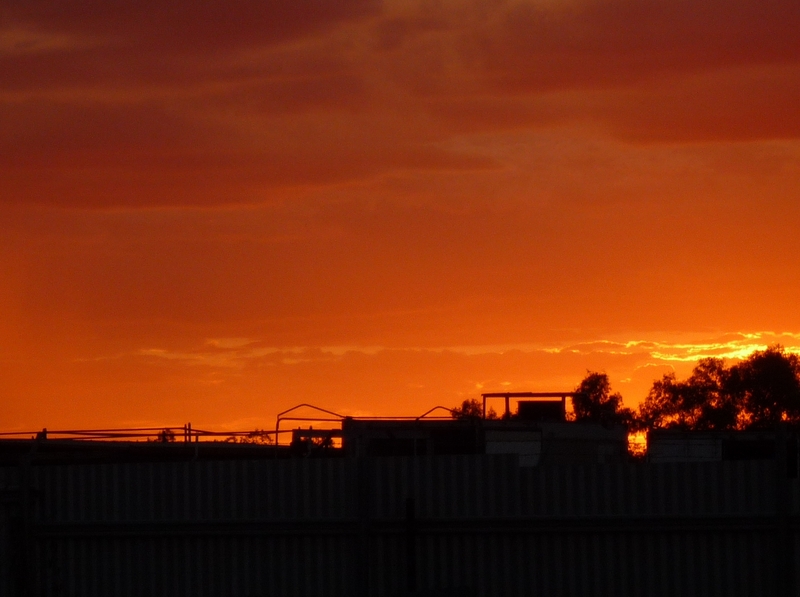 They say the redder the sunset, the hotter it is so you’ll understand that it was very, very hot. So far, temperatures for 2013 have remained stuck in the 40s day and night making it quite difficult to sleep. Unlike the Ivanhoe residence with its 6 separate split system air conditioners, Enngonia has a ducted system (at around $20 a day it doesn’t get used), a window rattler (think 1950s model) that makes a very loud noise but doesn’t really cool anything and, in the back room, a modern split system, which actually works. Despite the fact that the back room faces directly west and is therefore the hottest room in the house we’ve furnished it with a bed, comfy chairs, TV and DVD player and, providing no one opens any windows or doors, we get some respite from the heat by running the air conditioner all night. Apart from forays to the dressing room or kitchen, where within 5 minutes you’re soaking wet from perspiration, we’re happy to reside in our little ‘cabin’ until the cooler months when we’ll return to the rest of the house. Of course, all energy saving plans have now gone “out the window”. In other news to hand: Thanks to Ms Gillard, it seems that every house in Enngonia will soon receive a free satellite dish and a VAST (viewer access satellite television) set top box because, like Ivanhoe, we’re too far out to ever receive normal digital TV…. so that will go straight to the back room too. Speaking of energy saving, one of the few advantages of the heat (well, actually the only advantage) is that we haven’t needed our hot water system since returning home last month. Our water is gravity fed from the town’s bore water tank, which is on top of a very tall platform in full sun. So the hot water system has been turned off and I dare say it won’t be turned back on any time soon! We did toy with the idea of cooling down in a rather large wading pool but after purchasing on line, setting up in the backyard and filling it with bore water, we soon discovered that, with only early morning shade, there’s nothing pleasant about sitting in very hot water in the middle of summer. 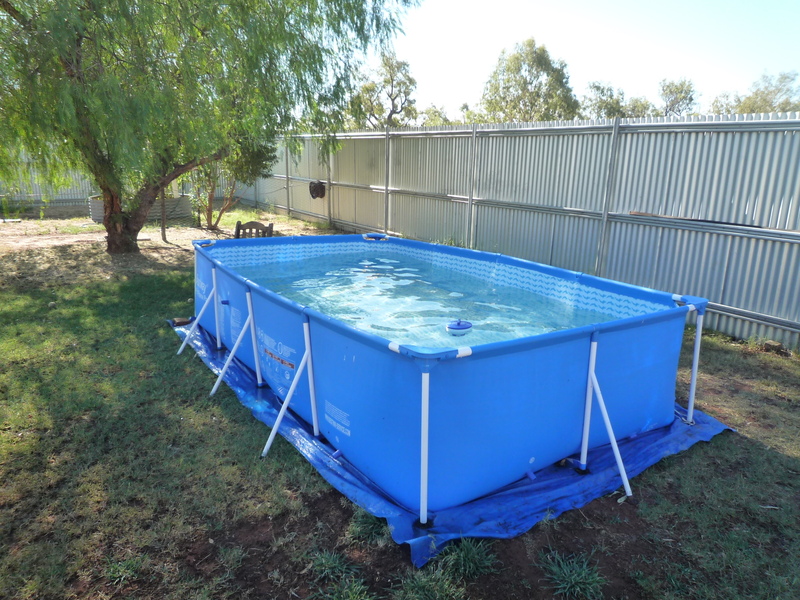 So the pool was quickly on-sold to people in Bourke, where they actually have trees and shade in their backyard. What is it they say about anticipation being better than realisation? Unfortunately, with two and a half year tenures, police are rarely motivated to plant trees that they won’t actually see grow so I guess we should be grateful for our one Peppercorn tree, which will one day no doubt be big enough to provide shade to the backyard. While a native of Peru, they’re really a widespread ‘weed’ in the outback (see Ivanhoe Post Office and main street photos). No one knows for sure but it’s thought that they were introduced in seed form during the gold rush of the 1800s. 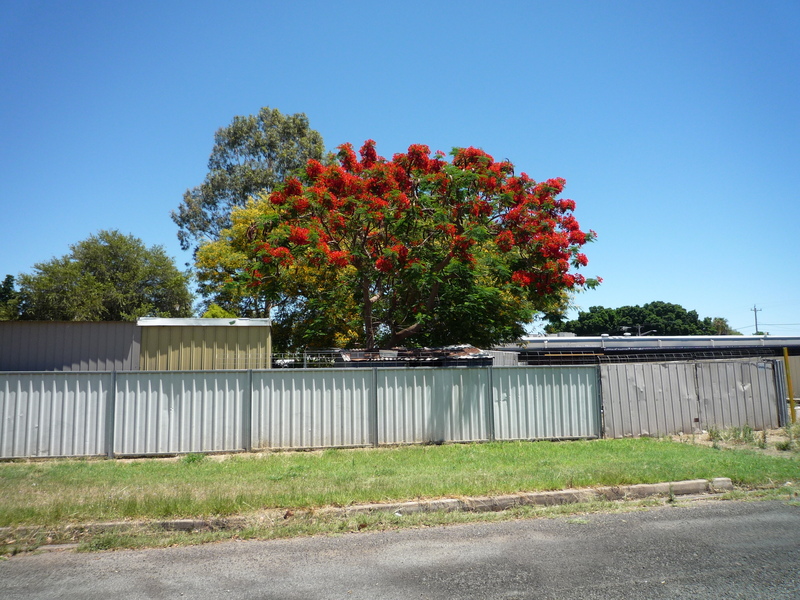 BTW, if anyone can recognise the tree with red flowers (photographed in Bourke) I’d be very grateful. While I’ve been buying and selling wading pools, Nigel has discovered that the town has its own tractor and even better, with the Fire Chief’s permission you can borrow it if you have a good enough reason.…… like cleaning up the station yard. So sipping cocktails in the pool has been replaced with sitting on a shiny red tractor and moving derelict cars around the police yard. Boys will be boys! Time really is flying past the front door because we’re about to celebrate our first six months back in the bush. And what better way to celebrate than to leave town, which is exactly what we’ll be doing in a couple of weeks when we fly to New Zealand (complete with winter clothes to ‘see us through’ until we acclimatise) to catch up with number 2 son and family. This will be followed by the mandatory fortnight in Paradise, which will hopefully make Enngonia’s long, hot summer much more palatable when we return. Next Next post: Who let the frogs out?